Imagine you're lucky enough to get a chance to take a class with a master woodworker who specializes in gorgeous spoons and bowls. That's what this dvd is like, except better, because you can stop, rewind and watch a section a few more times if you need to. Jögge Sundqvist is that master. This is a re-release of an older video. The older video is good quality and it is on par with my favorite craft shows and dvds that are currently being produced. Mr. Sundqvist is an enthused teacher, who starts from green (fresh cut) wood and using hand tools creates bowls that can be used as dough bowls or as a gorgeous fruit bowl centerpiece and spoons from the wood. The tools used are easy to find, an ax an adze, a knife and gouges primarily with spoke shaves for finishing parts of the bowls. He takes you step by step from splitting the wood to make a bowl and picking the best pieces and designing the bowl to fit the wood to what branch shapes make the best spoons. He shows each step of the process clearly, demonstrating how he holds the knives for safety and how he positions himself to chop the wood. I love the bowls, and they are a great project, but I have a weakness for handcarved usable wooden spoons in my kitchen. The spoons demonstrated are gorgeously shaped, elegant and frequently decorated with pretty carving. He talks about the history of wood carving in his family, and one of the things I loved was the obvious deep pride he takes in his work and in his home. 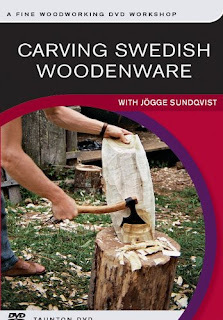 Recommended absolutely for people who are considering hand carving, for people who want to learn more about making wooden spoons and bowls and just because it's a very enjoyable DVD. It's one I watched with my family, and they all enjoyed it, and feel very confident about making me lots of wooden spoons and even a few dough bowls this summer. Published by The Taunton Press- the publishers of Fine Woodworking Magazine.